Jakarta International Java Jazz Festival returns for its 7th year in 2011. Themed “Harmony Under One Nation in Remarkable Indonesia”, Java Jazz Festival promises to roll out its charms once more. Scheduled to be held on 4, 5, 6 March 2011 at JIExpo Kemayoran, the presence of this festival is definitely a grand event to look forward to. For the real music lover : Prepare yourself for another Remarkably Jazzin’ Experience! Come and see the Java Jazz Festival in Jakarta and combine this with a nice relaxing holiday. Just to mention a few names, performing during the event: Bob James-George Duke All Stars-Tony Monaco-Vinny Valentino-David Garfield, special shows with George Benson, Santana & Fourplay!! 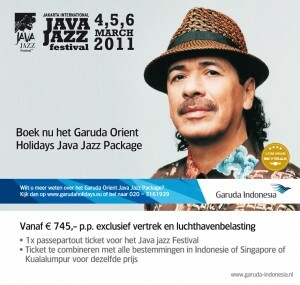 Santana Headliner op Java Jazz Festival 2011! Santana is een van de grote headliners van het Java Jazz Festival 2011. Bekijk de onderstaande video van Santana met Samba Pa Ti live in Mexico! Santana met Samba Pa Ti live in Mexico! Santana op Java Jazz 2011!